2018 is poised to be a landmark year for the healthcare industry. Millions of patients will receive their first online video consultation without having to visit a doctor's premises, while thousands of others will be able to use their mobile phones as diagnostic tools. The healthcare industry itself will become more stable and self-sufficient, while incorporating technology into every facet of its inner-workings and obtaining valuable insight from real-time data analytics. 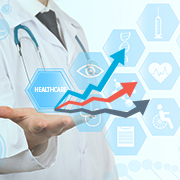 The positivity with which the healthcare industry will function in the coming years will also have a domino effect on many other inter-related industries such as the insurance industry, banking industry, healthcare vendors and suppliers, etc. Overall, the consumers will benefit the most from such positive trends, as shift-by-shift and visit-by-visit doctors, surgeons, and other clinicians will leverage technology to help their patients lead better, healthier lives. In this article we will try to highlight different healthcare trends expected to have the greatest impact on the healthcare industry in the coming few years and try to ascertain how it will affect the people involved. Drug pricing is always a sensitive topic. Currently, consumers have become even more vocal about how they feel about the rising drug prices and high-deductible healthcare plans. As a result, in the coming years we can expect to see an increased governmental regulation to control the rising drug prices. More than 53% of the consumers are already open to paying the cost of drugs overtime, instead of all at once, a statistic which could give rise to several new drug pricing models in 2018. Pharmaceutical industries would also focus more on conveying value through their services, a fact which could see a momentary shift in how the drug price wars are fought from here on. Before the curtains fell on 2016 and the new year began, the healthcare industry already had seen more than $400 billion in organizational agreements and partnerships. This trend should continue well through 2018 as well, as insurers look to boost their negotiating power and seek out various competitive advantages and diverse revenue streams. In the coming years, collaborations between hospitals, clinics, and other top and medium tier health systems will generate more consumer interest and better services for patients. As more independent organizations partner and merge their way towards industry consolidation, we can also expect to see rapid scale up in the case of more modern technology being used to serve the patients. Mobile health app adoption rates are going through the roof, with more than double the app downloads as compared to previous years. Today, consumers and patients are not only using their smartphones and smart watches, amongst other interconnected devices, to monitor their health, but also to receive expert diagnosis from remote proximities in the comfort of their own homes. "Bedless hospitals" - however ridiculous they may sound - are actually a thing now, as patients get treated without ever stepping a foot inside the hospital, and this number is only going to increase as more than 60% of the people are already willing to try out the latest health and remote diagnosis apps. While technology-adoption is on the rise in the healthcare industry, it is the threat of hacking and insufficient security measures which is keeping close to 50% of the people from trying out any connected healthcare device. Imagine the chaos that would be caused when hackers gain the ability to hack connected medical devices such as insulin pumps and pacemakers! As a result, in the coming years, we can expect hospital administrations and the healthcare industry in general to become more proactive when it comes to securing their medical equipment. This in turn means top-notch network architectural services will have to become a norm rather than an oddity. Medical expenditure is on a rise. As the amount of money being spent to take care of one's health rises, consumers will start looking at options including trained professionals who could manage their health spending similar to their retirement plans. 2018 will see a spurt in healthcare providers bundling innovative healthcare finance offerings with other plans to retain patients, and offer plans akin to air miles and frequent flyer discounts. Such models will therefore cater to two important consumer needs - convenience and value. Unfortunate but true, behavioral health is poised to become a major area of concern by 2018. One out of every 5 Americans experiences a form of mental illness every year. PTSD (Post-traumatic Stress Disorder) is on the rise amongst soldiers, and various other mental illnesses are gradually being defined as we hurtle towards a complex future. As behavioral healthcare starts costing the healthcare industry more than $440 billion annually, 2018 was supposed to be the year when doctors and physicians sat up to take notice, and address the many issues affecting patients - many of whom don't even know that they have a mental / behavioral illness. The biggest dilemma in front of healthcare providers has always been how to deliver the best possible results while keeping the prices down. In 2018, mounting budget pressure on hospitals and clinics will see them reacting positively and coming up with innovative ways to deliver quality healthcare. Biosimilars are the next big thing on the horizon. These alternative drugs can only be generated from living organisms, and are supposed to be introduced in the US market by 2018. There are currently 50 biosimilar drugs pending for approval by the US FDA. These drugs would not only counterweight rising traditional drug prices, but also boost the overall healthcare standards within the country. At O2I, we believe that the healthcare industry of tomorrow would be a continuously evolving one, where frequent policy changes, societal shifts, and technological innovations will walk hand-in-hand with customer service and patient approval rates. We have been a chosen healthcare service provider for global healthcare industry leaders for the past 20 years, and our experience in the sector allows us to keep abreast with the latest healthcare trends in 2018 as and when they arrive. Contact us now to learn more about our many services, and partner with the healthcare professionals who know your business inside out.